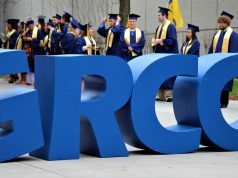 GRCC's Alex Pierson (1609) being cheered on by teammate Nikki Gewirtz, as she nears the finish. GRCC’s Brad Heilzelman starts his kick near the end of Knight Invitational. 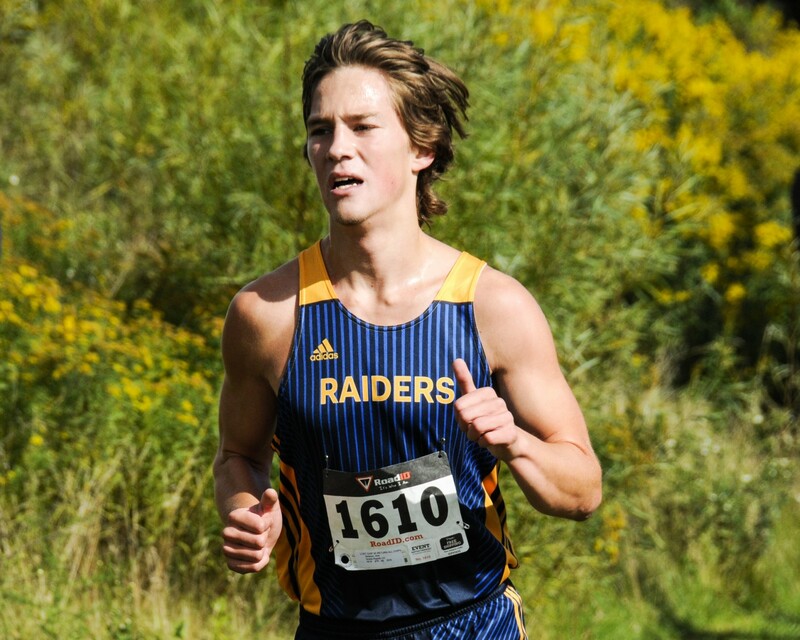 GRCC’s Carter Versluys (1617) gains on other racers at the Knight Invitational. 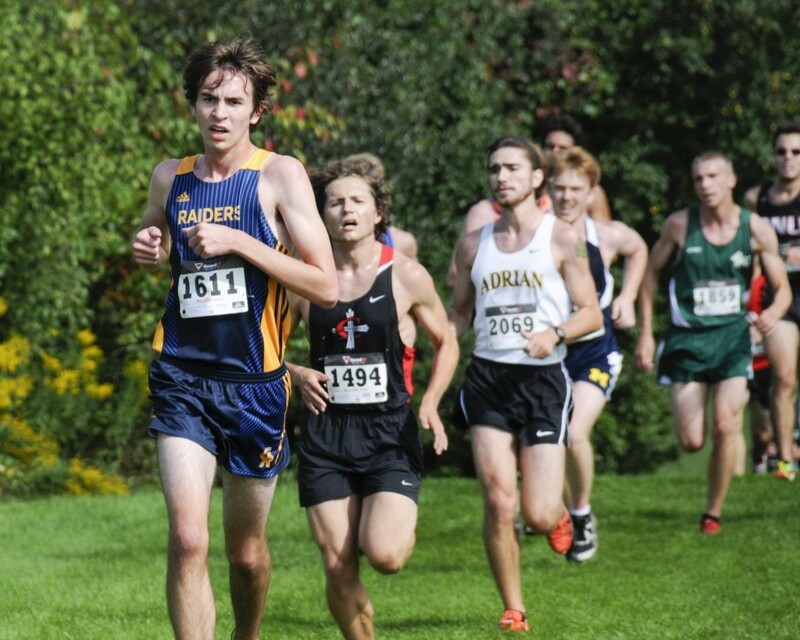 GRCC’s Isaiah Fox leads a group of runners during the Knight Invitational. 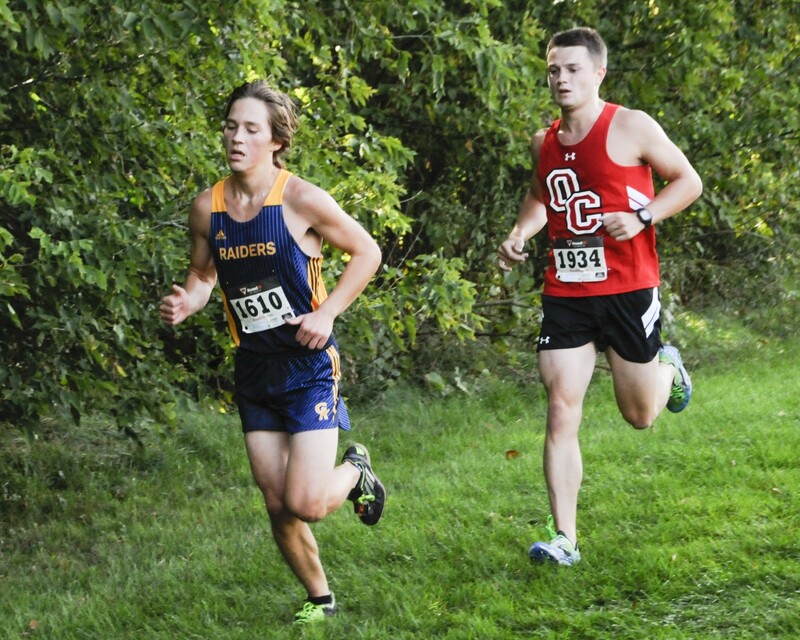 Raiders Kirk Dickson (1610) is being chased by a runner from Olivet College during the Knight Invitational. 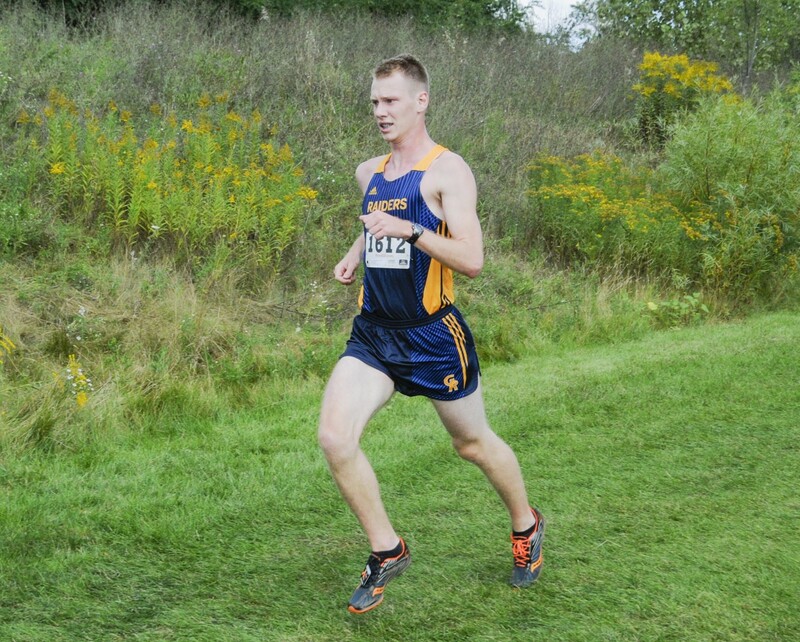 GRCC’s Brad Heilzelman races in the Knight Invitational. 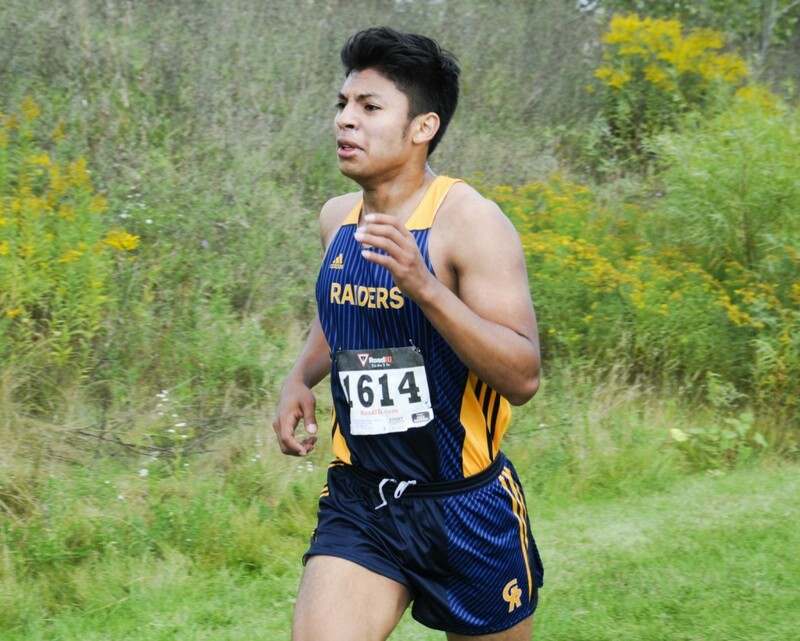 GRCC’s Denis Martinez (1614) keeps pace with other runners. 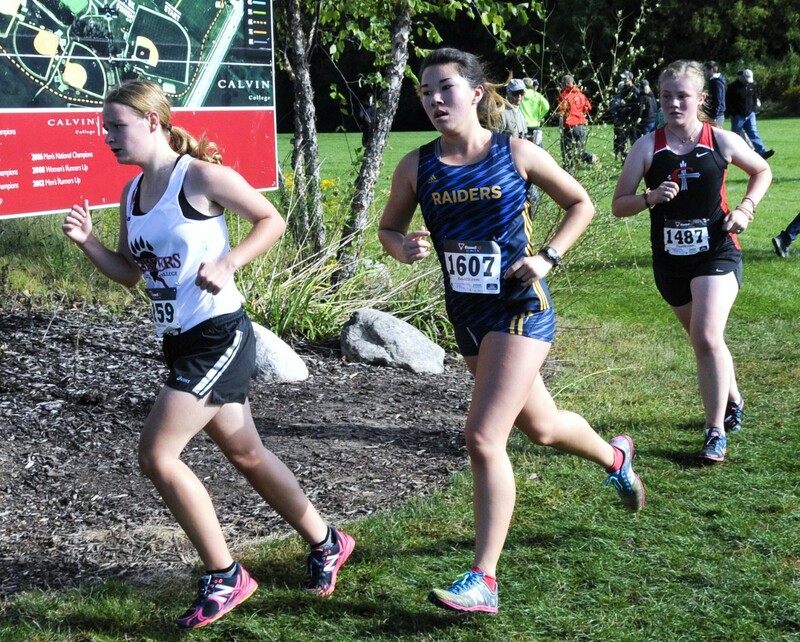 GRCC’s Alicia Geene in full stride. GRCC’s Alicia Geene nearing the finish line at the Knight Invitational. 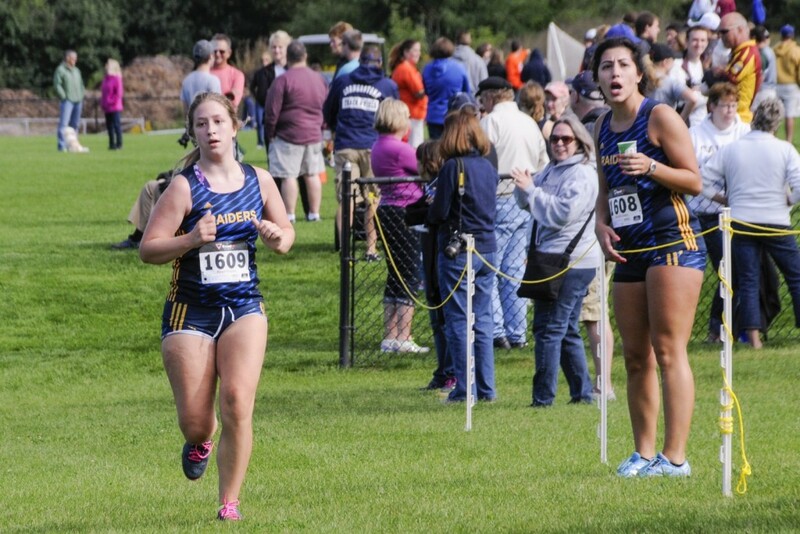 GRCC’s Alex Pierson (1609) being cheered on by teammate Nikki Gewirtz, as she nears the finish. 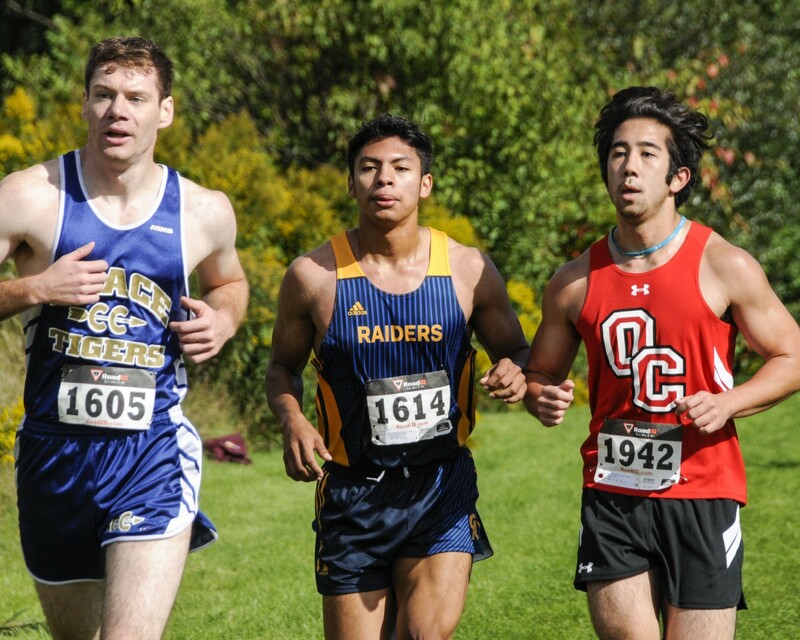 GRCC’s Isaiah Fox passing a runner from Alma College during the Knight Invitational. 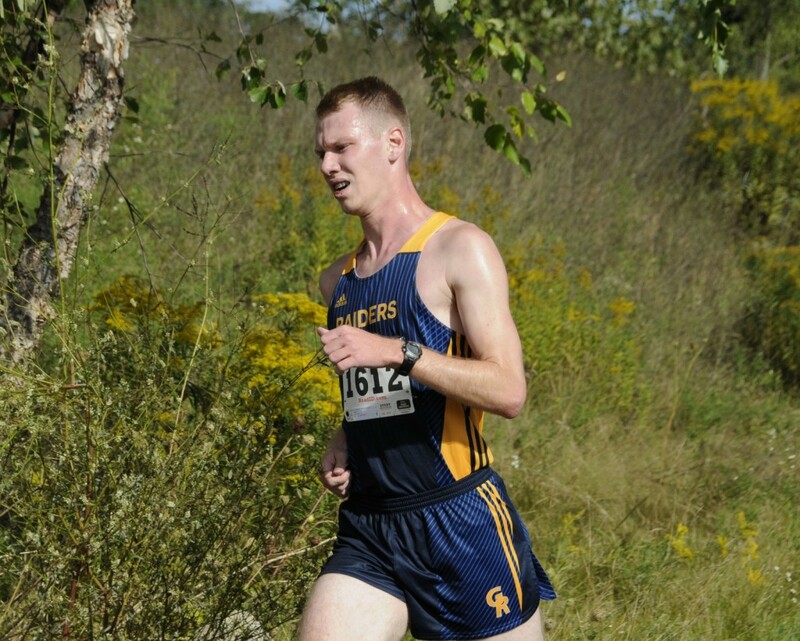 GRCC’s Kirk Dickson running in the Knight Invitational. 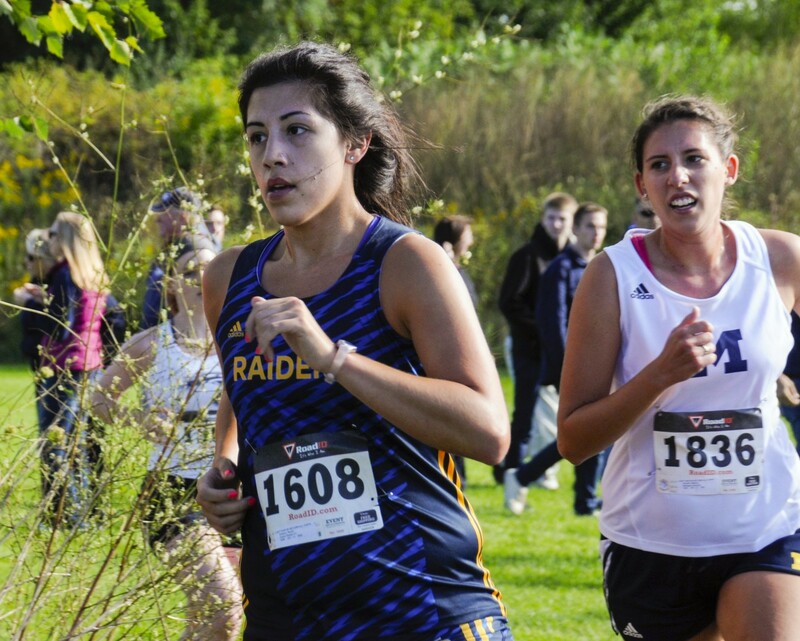 GRCC’s Nikki Gewirtz on the last leg of the race at the Knight Invitational. 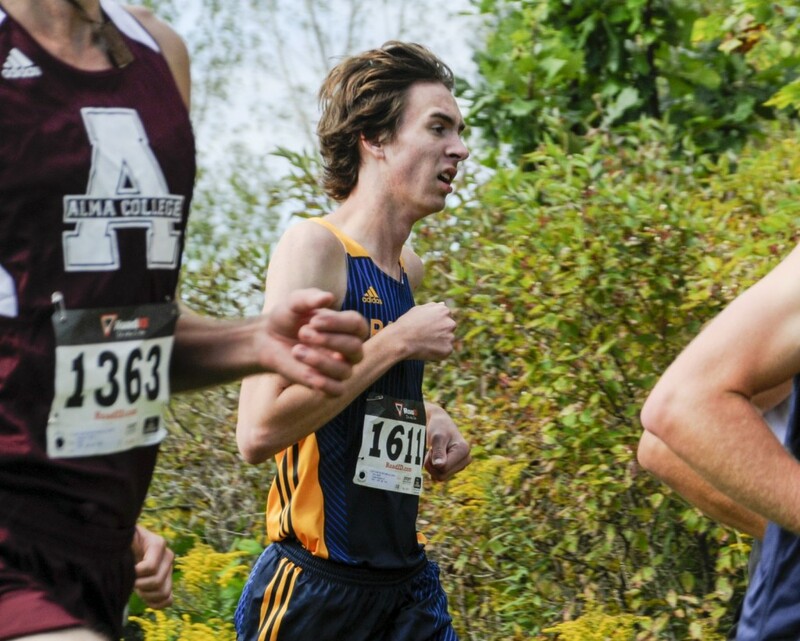 GRCC’s Alex Pierson in good form at th Knight Invitational. Photos By John Rothwell. 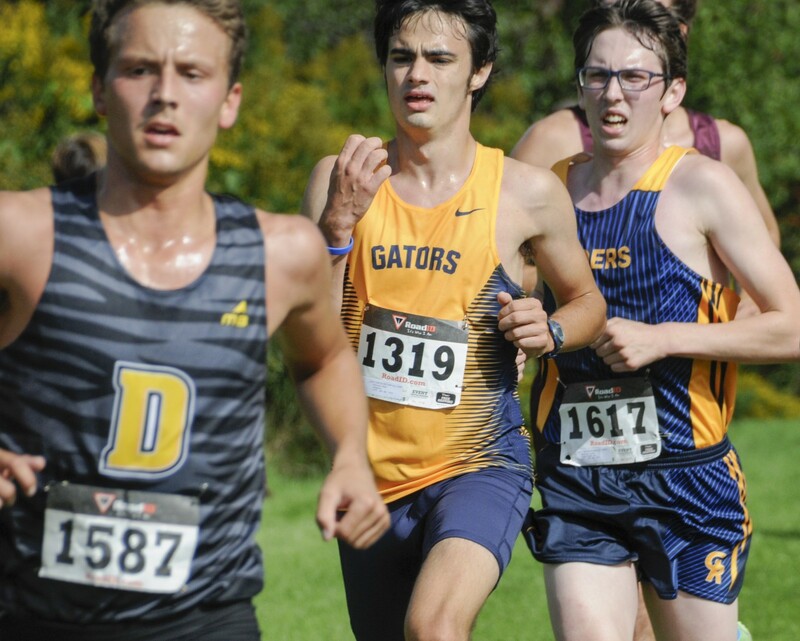 The Grand Rapids Community College cross country teams had a big test Saturday morning at the Calvin Knight Invite. The men finished 24th, while the women didn’t place. According to Coach Matt Sicilia, it was the best race by the women all year and the best he has ever seen them perform, while a lot of the men made strong strides to getting better as well. Sicilia said it was one of the first weeks where their legs were not tired from workouts, making it a week that they should have major improvements. “The ladies blew me away, that was by far the highlight of the season, everyone of them ran their best race of the year, some of them the best race of their life,” Sicilia said. 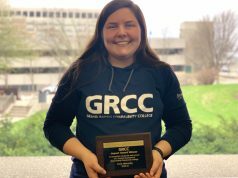 “Alex Pierson who has finished last in every race she has competed in throughout high school and college ran a nine-minute best. The men’s team features six runners, five of whom are freshman. Jose Lozada fell down during the race and hurt his ankle, affecting the team’s score. Isaiah Fox had the best time on the team at 28:03.07. Kirk Dickson had the next best time on the GRCC team at 28:25.1. “It was a pretty good race, a lot of flatness and some hills, but mostly flat and I improved my time by over three minutes so it was a good one for me, personally,” Carter said of his 29:00.2 time. Denis Martinez Ramos finished fourth with a time of 33:47.6, and Brad Heitzelman came in fifth with a final time of 34:35.6. The women’s team only has four runners, making it ineligible to place. Alicia Geene and Nicole Gewirtz are both returning sophomores, Pierson is a freshman, and Jessica Fraly is new to the team. Fraly had the team’s best time at 20:15.5. “I felt really strong the whole race, it was a personal best, and it was only my second race,” Fraly said. Gewirtz had the second best time of the women finishing with a time of at 22:56.9. Gerwitz thinks this race will be inspiring for the rest of the season. 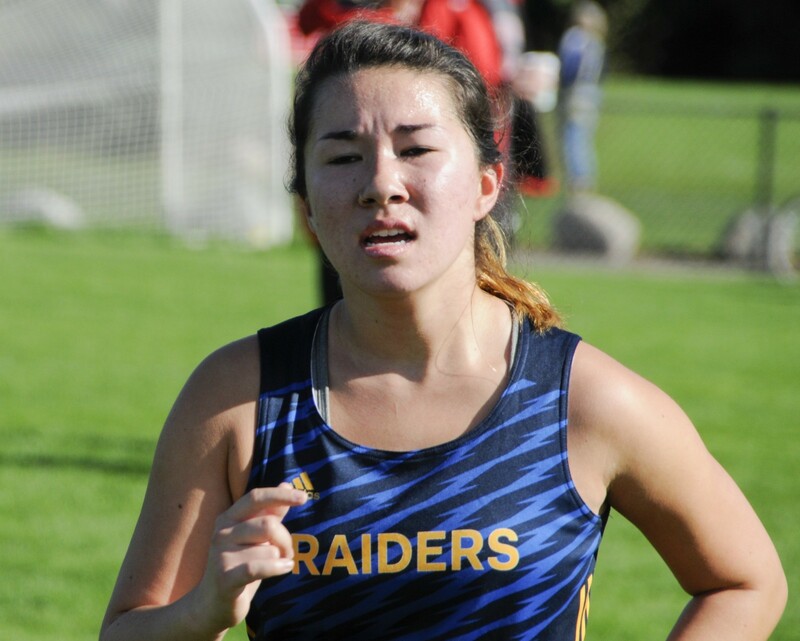 Geene came in third out of the four GRCC women runners, and her time was 24:53.7. Pierson finished in the final spot with a time of 34:20.6. “Our entire team did super well, probably the best so far this season,” Geene said. 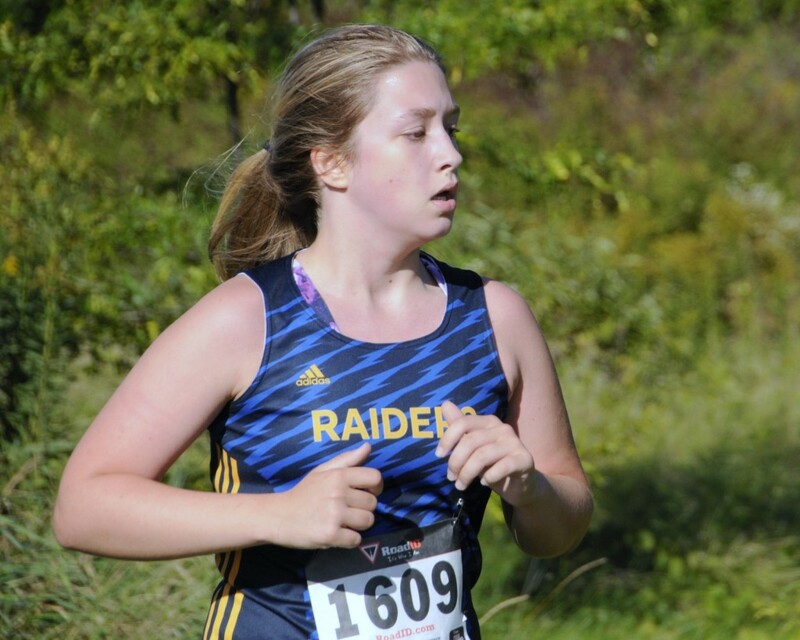 GRCC’s next meet is at the Lansing Invitational Oct. 9.